SCRAPiVERSE: I love being around artistic people! I promise, before the end of this post, I will try to find some way- however weak it may be, to associate this post with something papercrafty or scrap-related. I'm lucky to work with lots of creative people. Check out this quilt that one of the most creative people I work with, is making, as a backdrop for her segment at a floral industry show. Yes, she quilted her own backdrop, for her show about the COLOR WHEEL. How amazing is this?! I was totally inspired. Use more color. That's what I'm inspired to do- continue exploring COLOR in my work. Okay- I guess that makes it scrap related. How else? Hmmm. I got it! The woman who made this quilt has also appeared on the same home shopping channel as TIM HOLTZ. What a link! i was only just reading craft donkey and read your hilarious post when you posted to me!! look up jim the gentleman crafter too, he has a group he started called men that craft. love your work and style! Love the quit. I dont think there needs ot be a direct link to papercrafting at all! I post on Mondays pictures of all sorts of things just to motivate people in whatever they do not just paper crafting. I in fact love those bright primary colors, which I think alot of crafters steer away from now that there's just such an aray of other colors and primary colors tend to pull us into generally thinking school pages or things of that nature and the lines and it got me thinking of all sorts of things! Thanks for sharing! 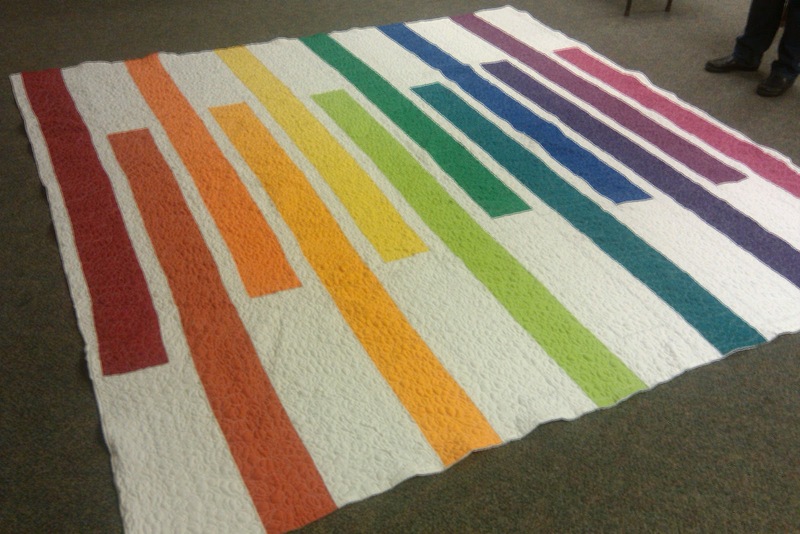 Love the quilt Kory, it is a lovely piece. Quilters amaze me. I don't have patience for that. I use color scrapping (with the help of a color wheel), it's patterns that blow my mind and I shy away from. One could use her quilt as inspiration for a card or layout. My blog is not all scrapping and designed as such... Take care.